Chess is as easy to learn as 1-2-3! You just need to know three things: 1. How to set up the pieces 2. How each piece moves, and 3. How the game ends. (Get the King!) So let's go! 1. Setup - Set up the pieces as pictured at right. White moves first. Then take turns. Only one piece moves on a turn (except for Castling*). You capture an enemy piece by landing on its square. The King, the tallest piece, moves one square in any direction. 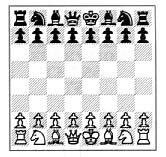 The King may never move into check -- that is, onto a square attacked by an opponent's piece. The Knight is tricky -- it's the only piece that can jump over other pieces. 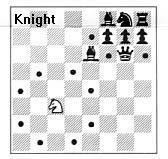 Think of the Knight's move as an "L" -- moving two squares horizontally or vertically and then making a right-angle turn for one more square. Finally, the Pawn is the only piece that captures differently from how it moves. 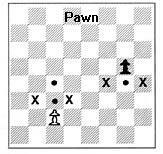 The pawn moves straight ahead (never backward), but it captures diagonally forward. 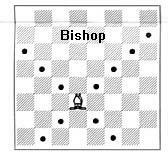 In the diagram, the squares with dots are possible moves for the pawns; the squares marked by an X are those on which the pawns may capture. A pawn moves one square at a time, but on its first move it can choose to move forward one or two squares. 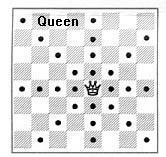 If a pawn gets to the other end of the board, it is immediately "promoted" to a Queen (or a Rook, Bishop, or Knight if desired). It's possible (but rare) for each player to have several Queens. Okay! I'm ready to play Chess! Indeed! Go for it! 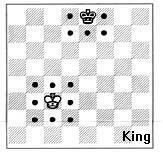 Though you should know about two special moves: Castling, and En Passant. Castling - Each player may "castle" only once during a game and when conditions are met. Castling is a special move that lets a player move two pieces at once -- the King and a Rook. 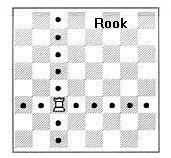 In castling, the player moves the King two squares to its left or right toward one of the Rooks. At the same time, the Rook involved goes to the square next to the King, toward the center of the board (see diagram). In order to castle, neither the King nor the Rook involved may have moved before. Also, the King may not castle out of check, into check, or through check. Further, there may not be pieces of either color between the King and the Rook involved in castling. What's a fair way to play chess with a child? First off, if you don't know how to play, now's a chance to learn something together with your child! If you're already adept, it's important to keep the game honest. Don't deliberately lose to a child -- they will learn very quickly what you are doing, and it will take much of the fun out of the game. Many kids are secretly delighted with a parent who beats them regularly (i.e. "My dad is a great player!") Still, you want to keep enough of a sporting element that the child sees their own improvement and develops a personal sense of accomplishment. Here are some suggestions that have worked for other families. Turn the board around. Give the child three chances to change sides during a game, at any three moments of their choosing. Reduce the number of chances to "flip sides" as they progress. Use time odds. Invest in a chess clock. Kids like using them in their own games. For you, give the child 7 minutes and yourself 1 minute. Not only may you lose on time, you will make natural errors in rushing yourself. Even if you win most of the games, they will be much more exciting for the child, who will be encouraged to think longer and harder. Find other children at about the same level. Teach some of your child's friends to play. They can play each other, or play as a team against you. Do chess puzzles together. Get any simple tactics book from the library, like Bobby Fischer Teaches Chess, and give the child a chance to show you (and themselves) how well they are doing. Team up against the computer. Set your chess computer program at a low level, be a team and choose moves together on the quest to vanquish the Digital Beast. Play the Pawn Game. Recommended by many chess teachers as a first step before teaching chess proper. Set up all pawns in their normal starting positions, with no other pieces on the board. Play proceeds normally. Use the En Passant rule, as in real chess. The winner is the first person to get a pawn to the other side of the board. (It's also a win if opponent has no pawns left, or no legal moves left.) This is more challenging than it first appears, and reports are numerous of 5 or 6 year olds beating their parents at the Pawn Game! For a summary of the studies examining the academic and social benefits of chess for youth, visit http://northwestchess.info/benefits.html.